I tend to wince when I hear new age music (it is, after all, the anti-punk) although I have to admit that it is pretty relaxing during yoga class. I have plenty of friends and relatives, however, who absolutely love Yanni and especially the new Yanni Voices album that takes Yanni's wordless compositions and gives them lyrical interpretation by four young singers - Nathan Pacheco, Ender Thomas, Leslie Mills and Chloe. All four were handpicked by Yanni to add their own words to his contemporary instrumental music. People are going crazy for this latest incarnation of Yanni and I have to say, the dude looks pretty good without the big moustache, even surrounded by young hotties. The YANNI VOICES: LIVE IN CONCERT Tour is underway now and garnering rave reviews. Would you believe they're coming to Wichita? Well, technically Park City. 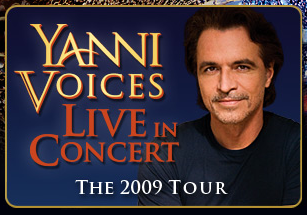 YANNI VOICES: LIVE IN CONCERT will be at Hartman Arena Wednesday, June 10th at 7:30pm. Thanks to the One2One Network (which you should join if you are a blogger), my pal Hannah will be taking it all in, even attending a post-show meet and greet session with the artists so she can report back to us. What's more, One2One is also offering one of my local readers the chance to win a pair of tickets! To enter and win a pair of tickets to the YANNI VOICES: LIVE IN CONCERT at Hartman Arena Wednesday, June 10th, please comment on this post with your favorite track from the Yanni Voices album. Entries will be accepted through May 31st and I'll pick the winner using Random.org. Wichita-area readers (or those who can travel to Wichita for the concert!) are eligible. I'd have to say, "Kill Me With Your Love" mostly because that's an awesome song title. Oh yeah - I'm busychild424 (at) gmail. I agree with Maggie -"Kill me with your Love" is too cool!